During my sophomore year in college, I worked as a security guard in a retail store. The only qualifications for the job were a short haircut and navy blue pants. The position required me to stand by the front door so customers could see me as they entered and, I presumed, be intimidated enough to go do their weekly shoplifting somewhere else. In truth, I spent almost every moment of each eight-hour shift either visualizing a ticking clock and trying to guess the time, counting the soup cans in a floor display and eventually falling into a trance, or wishing an important artery would burst somewhere in my body. 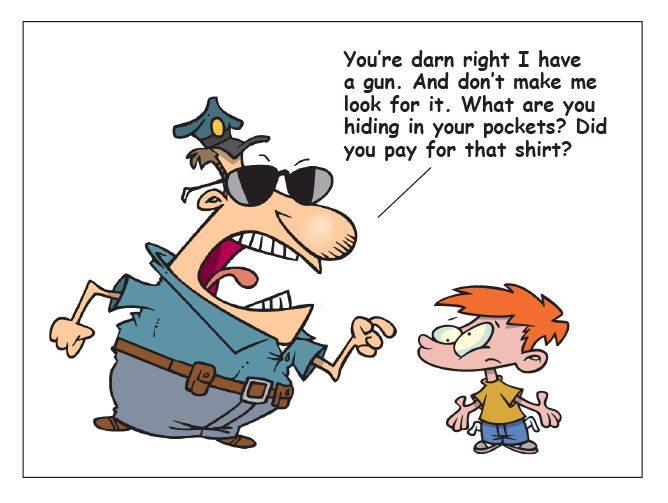 A small boy once looked up at me and wanted to know if I had a gun. He was stomping on my foot while he asked this, so I suspect he already knew the answer. Now and then I would take a casual stroll up and down the aisles. I did this to remind the customers of my presence, and because sometimes my foot would fall asleep from all that stationary standing and going into trances. I also hoped to find opened packages in the cookie section. One day the power went out in the middle of the afternoon. The store was plunged into total darkness as dozens of customers streamed out through the front door, many clutching their coats closed in a somewhat suspicious manner. The manager was furious that I wasn’t following everyone outside to make sure they weren’t stealing. He wanted me to find people putting unbagged merchandise into their cars and demand to see their receipts. By that time I’d lasted longer than any other security guard the store had ever had, but I was burned out and took the power failure and the manager’s anger as a sign that I should quit. It had been a long three weeks. In my junior year, I was a shipping clerk at a mail order company that sold supplies and accessories to coin and stamp collectors. The technical term for a coin collector is numismatist, while stamp enthusiasts are called philatelists. These words alone should give you some idea of what kind of oddballs these people were. I couldn’t begin to guess how much they invested in their actual collections, but was shocked to see the money they spent in order to get just the right pair of tweezers, that perfect magnifying glass, or a new album with their name embossed in gold leaf on the cover. We worked in a dusty warehouse basement with no windows, so going to lunch wasn’t just about getting something to eat. It was also about seeing the sunlight, sneezing our brains out, and determining who had gotten the most paper cuts that morning. One Saturday afternoon, I was working alone to catch up from a busy week. As I filled a box on the shipping counter, I heard a sound very close to my left ear. It was a kiss. Clear and unmistakable, as though someone had walked by within two feet, turned toward me, and kissed the air. The radio wasn’t on, so I assumed someone had come in and was being obnoxious. I stopped what I was doing, walked around, and saw no one. Both doors were still locked and latched from the inside. I stood and listened without moving a muscle. It was quiet. There was nobody else there — at least nobody I could see. With the half-filled order still sitting on the counter, I flew out the back door, got into my car, and raced home. To this day, if I hear the words numismatist or philatelist, a little chill runs up the back of my head. The meeting, it turned out, was a recruitment session for a multi-level marketing operation that involved selling soap and other household items door-to-door, as well as sponsoring new distributors into the business. There were nine other people at the meeting, and as we went around the table and introduced ourselves and explained why we were there, I discovered that I was the only new prospect in attendance; everyone else was already involved. I felt like a zebra with a bad leg in a roomful of hyenas. An hour later I had signed up, forked over fifty dollars, and left with my starter kit, which was filled with overpriced toothpaste, concentrated cleaning products, and some motivational cassette tapes. The idea was that you earned bonuses on your sales, as well as on the sales of anyone you had sponsored. I knew the concept worked because I’d seen photographs of successful distributors standing in front of large, expensive-looking homes. Most of these people had two or three cars and a boat parked outside, and one even had a snowmobile. All had straight white teeth and impressive tans. But here’s what grabbed me. At the end of the meeting, one of the guys did a product demonstration. He set two glasses of water on the table and put drops of red food coloring in each. Then he poured a scoop of a well-known brand of powdered bleach into one of the glasses and stirred like crazy. The water changed slightly to a murky pink, but that’s as far as it got. To the second glass he added some of the company’s powdered bleach and mixed it in with a spoon. The red water gradually lightened, and in about thirty seconds the color was gone. I was amazed. “This stuff really works,” I thought. I imagined myself in one of those photographs, smiling, tan, and enjoying multiple transportation options. A few days later, after practicing at home, I called our next-door neighbor and asked her if I could come over to give a product demonstration. She agreed and minutes later I was in her kitchen with my box of bleach and some red food coloring. We got the glasses of water set up, and then I asked my neighbor to bring out her bleach. She went into the laundry room and returned with a plastic jug. All she had was liquid bleach. I was unprepared for this variation in the test, but had no choice but to forge ahead. I poured a capful of her bleach into the red water and before I even had a chance to stir it, the water turned crystal clear. It was instantaneous, like some violation of the laws of physics. I stared first at the transparent liquid, now devoid of any trace of food coloring, and then at the other glass of red water. My box of bleach sat nearby on the counter, looking hopelessly outclassed. “What happens next?” my neighbor asked. “You keep using that bleach,” I said. “That stuff really works.” I imagined myself in a new photograph. In the background was a run-down apartment building. My twelve-year-old Chevy Impala with the two flat tires was parked in front. I had very few teeth. I quit the multi-level marketing business after ten months. During that time I sold almost nothing, sponsored no one, and spent a large sum of money on meetings, books, and tapes. My own mother refused to buy anything from me, and even insisted I pay her back for the bottles of red food coloring I’d wasted on the bleach demonstrations. All told I received one bonus check, in the amount of fifty-one cents. I had heard that many of the people who went on to incredible success in the business claimed they’d saved their very first bonus checks as a stunning reminder of how far they’d come while building their empires over the years. I cashed mine and bought a pack of gum. Years later, I took another crack at the same opportunity. The emphasis that time was not on just reaching my own dreams, but doing so by helping others reach theirs. I wasn’t a door-to-door salesperson, but an adviser, someone who would help guide fellow distributors to financial independence, achieving an unimagined level of wealth in the process. Right now, I have newspapers to deliver. 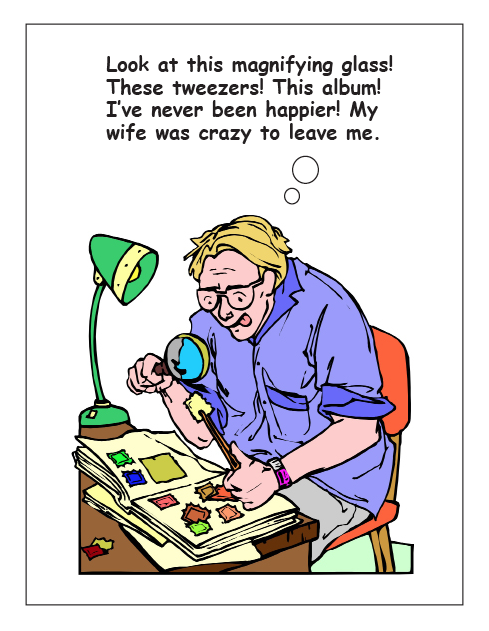 Visit Ron Leishman’s website to see his original cartoon art. “by helping others reach theirs” Now that’s a person that truly understands life. It is a noble thought, Carl, but not one I came up with. That was part of the overall philosophy of the business. Or at least that’s how it was presented. I wonder how similar our stories will be, Margaret. Can’t wait to read yours. Why am I guessing that there must be 10 other readers of this blog with a variation on the theme? Wonder how many of them are tan and have bright straight teeth?? I didn’t know you had a similar story — when can I hear about it? (The hint wasn’t enough for me.) I do know a few people with deep tans and straight teeth, but they didn’t get them from success in business; most just used their credit cards. You are hilarious. I could say that a hundred times and never get tired of saying it. This post and the first one read like the adventures of a much more endearing, delightful, and incredibly talented Forrest Gump. I was so hoping to see a post by you today, Charles and now I can leave the computer and get ready for work. I pray you’re enjoying your visit with your brother and that all is well. Thank you, SDS. I appreciate your kind words, as always. It’s been a week filled with laughs and tears. The adventure never ends, does it? Your tale of soap & sales is very familiar, Charles. I tried several MLM plans in my younger days, and failure in those ventures is probably why I’m so jaded against the MMO claims of today. maybe some actually become “6-figure bloggers” but I don’t know any of them personally and I seem to be missing the millionare gene. Your smooching spirit sounds like a good start on one of those paranormal romance stories. Not that I read paranormal romance stories – I just know those are hot sellers right now. I think many of us may have similar, but, unique, stories related to MLM enterprises. Maybe we should all post about them on the same day. Charles, if closets could talk, what would my closet tell your closet about the unopened box of business cards, the pristine training cassettes and the mountains of hopeful order forms, all blank and sorrowful. You bring back fond memories of the industry in which I lost several shirts. Sorry for the fond memories, Mitch. I purged my closet of all that stuff years ago. And I’ve been waiting hungrily ever since for someone — anyone — to contact me about the same business opportunity, because now I know what to say. But the phone hasn’t rung, and another great speech goes to waste. Have you blogged about your experiences? I’d love to read about them. Thanks for asking and allowing me to share the link! Just read it, Mitch. What a journey you’ve been on — I can almost see the bruises on your face. But I bet you’ve remembered and implemented every lesson you learned along the way. My father worked as a night security guard in Edmonton in the mid-80s…he used to tell stories of being propositioned by hookers while he was on the job. I used to buy stamps from mail order companies like that when I was a kid…I’m missing a giraffe stamp from an order I sent in 1976…have you seen it? I have extended family members who actually made quite a bit of money with MLM in the 70s and 80s…scary stuff though…quite cult-like! I wouldn’t be any good at it either! Fun post as always, Charles! Sorry about the giraffe stamp from 1976, Wendy. It was on back-order and should go out next Tuesday. By the time the little curious boy was stomping on your foot, I knew you’d given us another pick-me-up for the day. Thank you! Even all these years later, it’s still hard to picture myself as a security guard. Can you imagine me with a gun? No. Not even if people stomp on your foot. No wonder you lasted the longest. I must tell you – my first car was a ’79 Chevy Impala. She was brown. Brown Sugar was her name. Yes, because of the Rolling Stones song. The ceiling was kept in place with different colored push-pins. It’s never easy working directly with the public, because there’s always going to be someone who’s unhappy with something. The trick, I guess, is to not take it personally — and to not give them any reason to make it personal. My first car was a light blue ’67 Impala. By the time I sold it, I had given that car a few names, too, although none as affectionate as Brown Sugar. I always feel better about my life when I read about other writers’ previous jobs. 😀 lol. Thanks for making me laugh, Charles. You can guard my house anytime you want, but I probably won’t buy your bleach powder. Thanks, Jess. I doubt you’d be happy with my guarding skills. Regarding previous jobs, I know a few people I wouldn’t have wanted to trade places with. Throughly enjoyed the post, had a bit of a laugh, I read this post early in morning so it was a great start for the day. Thanks, magsx2. That’s really nice to hear. Ah, yes, Charles, I remember your MLM days (though I’m not sure if that was your first foray or your second). I also recall you sacrificing many weekends to seminars–and many dollars to those darned tapes. Thanks for a pleasant start to my day. I’m thinking of you and your brother this week…. That would’ve been my second foray, Sarah. It lasted a lot longer than the first, and cost me a great deal more time and money. Fabulously funny, as always! You made me recall my short-lived career selling cabbages door to door as a kid. Thanks for the (still slightly humiliating) memory. Mitch, I had several coin collections myself, and ended up selling them for far below what they were worth. I hope you do better. You’ve had some very interesting jobs, Charles, and I’m grateful that you write about them. Have you seen the Seinfeld episode where George offers the security guard a chair? Did you ever want a chair for that job? I would’ve loved a chair, Kevin, but it would have detracted from my incredibly powerful image of authority and intimidation. This reminds me…I still have some money sitting in an account that I didn’t collect. Wonder how long those nickels and dimes sit there before the MLM firm reclaim it. Does it become the retirement plan for the person who started it? Hope they don’t accidentally break their Jaguar’s window with their diamond as they wave at us. You too, Amy? We really should all get together and tell our MLM stories. Maybe it would save someone else from falling for the marketing pitch. Thank you, Val. I’m glad you liked it, and I hope all is well on your side of the Atlantic. We’ve all had those *jobs* but I don’t think many of us could write about them like you do BB. Very funny. I had trouble with the standing, too, Rosie. It’s a wonder I lasted as long as I did in a job that involved doing absolutely nothing. Saying those words was no problem, but I wasn’t sure how I’d collect the reward from you, so I helped myself to some microwaved ice cream last night. Thanks! Hey! A little respect for the pneumatics and the philadelphians, sir! My dad was both of those, and to this day I have his stamp tongs (tongs! not tweezers!) and his folding magnifying glass in my family-heirloom-hurricane-evacuation-suitcase. Most of both collections are gone now, although I still have his Indian Head penny collection (minus only two coins) and I just discovered I still have four albums of full sheets. They’re fascinating, because they all are from the period 1931-1975. Looking through them is looking through our country’s history, and getting a glimpse of what people thought was important back then. Looking at them, I find myself thinking, “Maybe we were a better country, then.” We surely were different. I debated for a long while about using “tongs” but decided on “tweezers” because it’s more easily understood. I have always loved coins and sold my collection for far less than it was worth. I’m equally stunned by the beauty of stamps and the history they represent. If I seemed to be less than respectful, it was more a reflection of the feelings I had back then (and mostly about the demanding customers who always seemed dissatisfied) than toward the hobbies themselves. I also have my father’s Indian Head Penny collection, as well as his Buffalo Nickel set. I still miss my Uncirculated Franklin Half Dollar collection, though. Just visited the Philadelphia Mint in March. I could REALLY use your numismatic skills today after I unearthed two giant cookie tins of coins that need to be sorted. Care to relive your junior year at MY house? I have few, if any, numismatic skills. Get your hands on a coin guide or look online. Or you could just haul the entire load to a local dealer, but then you’d have to trust them for an honest assessment. There were a few more jobs that I left out (at least five), but still, I’m sure there are people who have had many more jobs than I have. I don’t think I’ve ever been fired, so no Part Three this time. Good luck with those coins, EOS. I never fail to learn something from your wonderful posts, Charles. Of course I knew the official term for a stamp hoarder, but I’d never heard the title for coin hoarders before! Numismatist. It looks as weird as Philatalist sounds. I think the collectors would disagree with your use of the term hoarder, but I agree that numismatist and philatelist are strange words. Collecting and hoarding are two different things, for sure. Thanks for drawing the distinction. My favorite line: “I felt like a zebra with a bad leg in a roomful of hyenas.” That would be a fun writing assignment. Describe one time in your life that you felt like a zebra with a bad leg in a roomful of hyenas. Can you imagine the range of responses one might get? Maybe we should try that sometime, Kevin: come up with a sentence and invite others to run with it. Yes, that would be fun. “It had been a long three weeks.” — Great line! And now you’ve got me scared of numismatists too. No need to be afraid, Melissa. I was a coin collector once, myself. It can make you a little obsessive (like scrutinizing every piece of change that crosses your palm, for example), but it’s a harmless hobby. It can also be educational. Also, loved this post. As usual. I enjoyed every piece you wrote, Damyanti. I hope it gets published in some form. Please let me know. I wonder, if you had been wearing your security guard garb, whether the phantom kisser wouldn’t have ventured near you. A friend of my mother got me interested in collecting stamps as a 6th grader. I stopped collecting as a 7th grader. But I still have my albums. I thought they’d be cool to hand down to my sons. Pffft! They couldn’t have cared less. I still have them. Maybe someone at the impending pre-move tag sale will be interested (don’t tell them I never used tongs when handling the stamps!). Pffft? Not uffda? Have you thought about selling them on eBay? About the phantom kisser — I couldn’t even intimidate the living as a security guard. What chance would I have had with a ghost?